Note: Creating a different homepage layout in the Flex Theme does NOT involve selecting a post template. A simple drag and drop of selected widgets should do the trick. Above is the screenshot of various widgets added in different widget areas to create the Flex Agency layout. 1. Top Left: Add a text widget to display the address or any other textual information. To display a marker or location icon next to the address, wrap the text with the ‘address’ class (see screenshot below). 2. Top Right: Add a Search widget (with no title) and a text widget with the telephone phone number wrapped with ‘tel’ class. 3. Logo: Go to Settings > General option. Text added to the ‘Site Title’ and the ‘Tag line’ will be displayed in the logo header area. To switch to an image logo, go to Appearance > Header and then upload a logo image. 4. Navigation: Go to Appearance > Menus and then select a menu as primary menu to be displayed at this location. To display social icons next to the primary menu, enable ‘Primary Nav Extras’ widget by going to Appearance > Customize option. Then add a ‘Simple Social Icons‘ widget to this widget area. You must install Simple Social Icons plugin for this functionality. 1. Home Top: Add a ‘Flex – Slider’ widget to this widget area. You can add image slides for the slider from the ‘Slider’ option located at the left sidebar. Then add the enews box by drag and drop of ‘Genesis -enews extended’ widget. 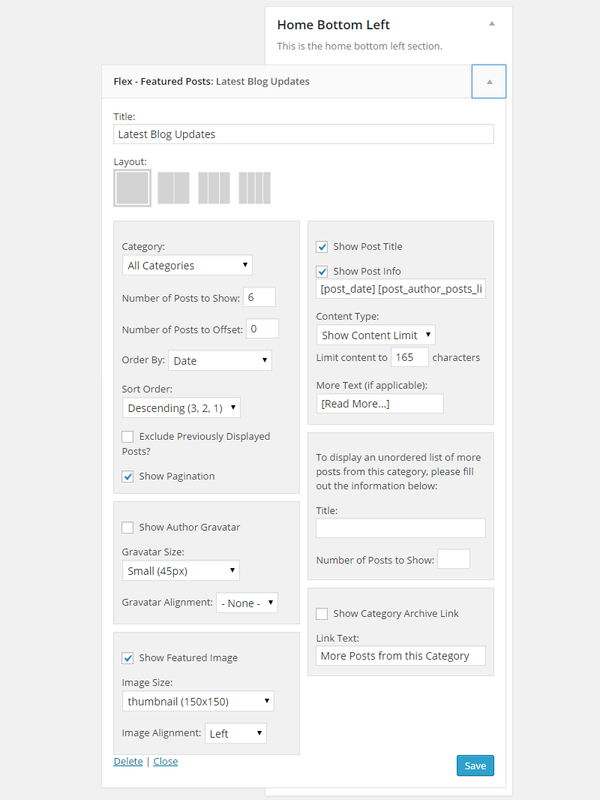 You must install the Genesis enews extended plugin for this functionality. 2. 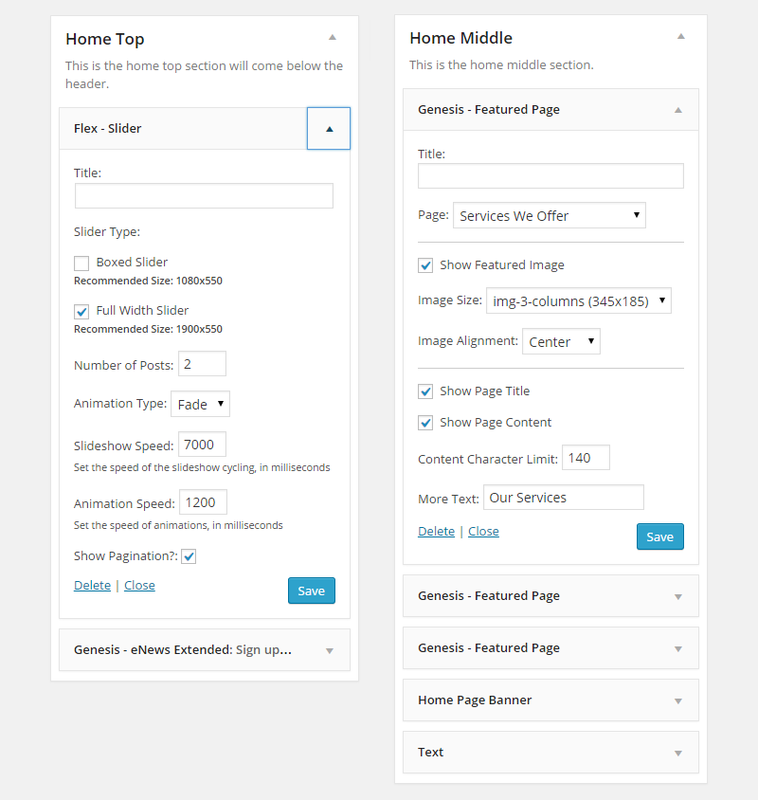 Home Middle: Add a ‘Genesis – Featured Page’ widget to the home middle widget area. Add upto 3 such widgets and they should align automatically in a three column structure. Then add a ‘Home Page Banner‘ widget to display a big image with an overlapping text. Under this, call to action box can be displayed via manual code added in a text widget. 3. Home Bottom Left: Add a ‘Flex – Featured Posts’ widget to the home bottom left widget area. Configure settings as per requirement. 4. Home Bottom Right: First is a text widget with the advertisement code. It is followed by: Recent Posts, Categories and Archives widgets. Lastly, a text widget with call to action code. 2. 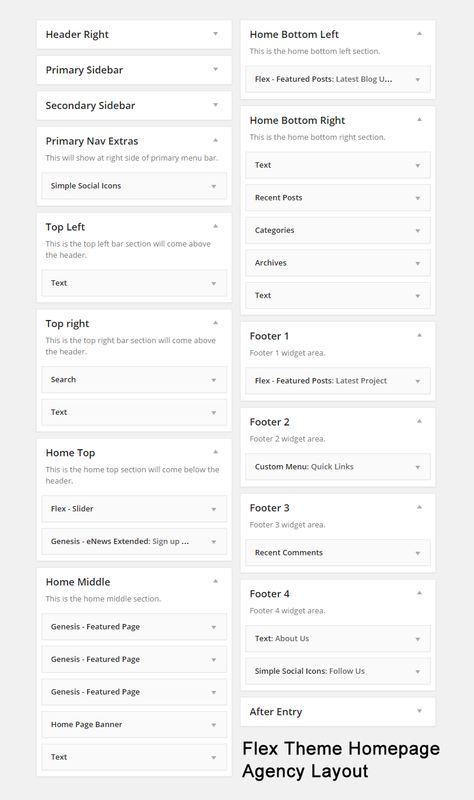 Footer Widgets: Go to Appearance > Customize and change number of footer widgets to 4. Then add required widgets to footer widgets 1,2,3, 4 areas.